New. 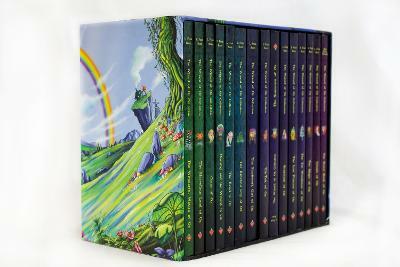 Journey through the magical world of Oz with Dorothy and friends in this 15 book collection by L. Frank Baum, redesigned and anglicised. BIC Classification: YFA; YFC; YFH. Category: (EJ) Primary; (ES) Secondary; (JC) Children's (6-12); (Y) Teenage / Young Adult. Dimension: 210 x 237 x 137. Weight in Grams: 2714. 2016. Paperback.....We ship daily from our Bookshop. New. The Wizard of Oz Collection . Intended for a juvenile audience. Intended for a young adult/teenage audience. Fine. The Wizard of Oz Collection . Intended for a juvenile audience. Intended for a young adult/teenage audience. In Stock. 100% Money Back Guarantee. Brand New, Perfect Condition, allow 4-14 business days for standard shipping. To Alaska, Hawaii, U.S. protectorate, P.O. box, and APO/FPO addresses allow 4-28 business days for Standard shipping. No expedited shipping. All orders placed with expedited shipping will be cancelled. Over 3, 000, 000 happy customers. New. The Wizard of Oz Collection . Intended for a juvenile audience. Intended for a young adult/teenage audience. In Stock. 100% Money Back Guarantee. Brand New, Perfect Condition, allow 4-14 business days for standard shipping. To Alaska, Hawaii, U.S. protectorate, P.O. box, and APO/FPO addresses allow 4-28 business days for Standard shipping. No expedited shipping. All orders placed with expedited shipping will be cancelled. Over 3, 000, 000 happy customers. Fair. Large tear in slipcase. Books are in great condition with clear, bright pages. Ships fast with tracking.